ETZzz Hostel Bangkok is conveniently located in the heart of Bangkok in a peaceful residential area near Lumphini Park. It takes 2 mins to walk to the nearest MRT Lumphini station, which connects you to pretty much everywhere in Bangkok, and 10-15 mins walk to Silom Road and Patpong night market (or THB40 by taxi). Chatuchak weekend market is just a few stops away on MRT. There are several street food vendors within walking distance from our hostel which offer foods from THB30/meal. A lot of our guests enjoy partying elsewhere but want to have somewhat more quiet place to spend a night resting and recharging for the next day. 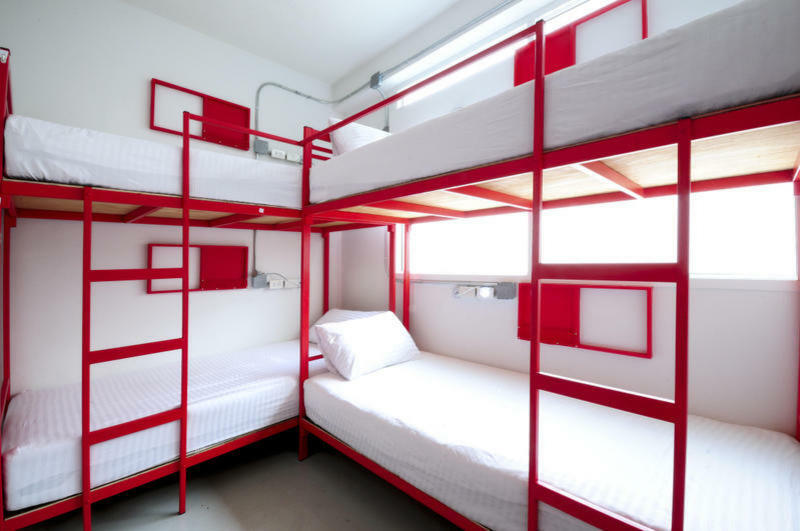 If you want to enjoy the hustling n' bustling Bangkok but also want to have undisturbed restful sleep at night, ETZzz Hostel is the right place for you. ETZzz Hostel is in Bangkok's Central Business District (CBD) which is about 30-45mins away from Khaosan Road which locates in the old part of the city but getting to it is easy and only cost around THB80-100 by meter-taxi or around THB30-40 by MRT/Sky Train/Bus/Boat. ETZzz Hostel offers a cozy, clean, and relaxing atmosphere with all-day air-conditioning in room and hot shower to make you feel like home. Our rooftop sun/moon deck is perfect for hanging out with friends or perhaps making new ones. It offers spectacular views of Bangkok's famous Lumphini Park with a backdrop of backlid skyscrapers at night. We found ETZzz Hostel on a ground of the fundamental hostel concept of being clean, simple & affordable and that is why we can offer a very low price and a good value for money bed for budget travellers. Our characters are admittedly not too fancy but yet not too plain as well. Give us a try and we are sure we will make your holiday experience memorable. We provide free WiFi throughout our property as well as web-cam equipped PCs to keep you up to date with what is going on in the world. On the ground floor also locate our travel shop, ETC Travel, where you can find tons of travel information, book your flight, train, or bus tickets to your next destination as well as accommodation. Those who would like to try our package tour ETC Travel also offer a wide range of travel arrangements from classical sight-seeing to adventure holidays, home-stays, community-based tours, or even volunteer work. Check in time: 2 p.m. If you arrive early feel free to wait in the common area until check in time. You can leave your luggage with us FREE OF CHARGE on the arrival date and up to two weeks after check out. However, since we have limited space for storage we can only allow one backpack/suitcase and one small bag per person. Storing of fresh foods and hazardous items are strictly prohibited and may be removed without notice. ETZzz Hostel cannot be held responsible for any loss or damage of the item stored with us. To comply with Thai laws, smoking is strictly prohibited anywhere inside the hostel. Smoking area is provided on the rooftop open-air space. Take exit 1 of MRT Lumphini station and walk towards Lumphini Tower direction. When you reach CIMB Bank, turn right into Soi Ngamdupli for 20m and ETZzz Hostel is on your left. The entrance is just behind our travel shop, ETC Travel. Just walk to the side of the building and ring the bell. BY TRAIN/UNDERGROUND: Take Airport Rail Link, Express [THB150, 15 mins] or City line [THB35, 20-25 mins], and exit at Makkasan Station then walk to MRT Phetchaburi Station. Follow Hua Lumphong direction and exit at Lumphini Station. Then simply follow the instructions above to get to our hostel. BY TAXI: We recommend you to take metered taxi (not airport limousine) from ground level of Suvarnabhumi Airport. The total cost for meter fare + THB50 airport surcharge + THB70 toll fees should be approximately THB350-500. Travel time should be around 30-60 minutes depending on traffic. Tell the taxi driver to go to Soi Ngamdupli. Find Pinnacle Hotel and our hostel is 3 buildings next to it. You can book our comfortable airport transfer service at extra cost (subject to availability). Please enquire/book by email to info@etzhostel.com at least 1 day prior to your arrival date.